The National Amateur Chukar Championship and the National Amateur Chukar Shooting Dog Championship are the most sought after Amateur Championships in the Western Regions. The Chukar Championships are the only National Amateur events in the west, typically rotating between Reno, NV for Region 11, Sunnyside, WA for Region 10 and Payette, ID for Region 9. It is literally a running joke — the first time you hunt Chukars, it’s for fun; after that, it is for revenge! That’s because these “Devil Birds” lead you on a merry chase up the nasty hills they inhabit. You follow clawing, slipping and sliding only to watch them tear downhill at rocket speed before you are close enough for a shot which you’d be too out-of-breath to make anyway. Field trialing these elusive birds requires a tough horse, tough dog and a fearless handler. A big-licked, smooth-gaited horse is of no use in the steep canyons and rock formations of the West. I’ve heard judges state, as our canine athletes rimmed the top of steep canyons, “If he goes on point, you are on your own”. In North America, Chukars live in arid to semi-arid, high-elevation shrubland, at between 4,000 and 13,000 feet altitude. They are usually on steep hillsides with rocky slopes — including rimrock, talus, and bluffs — that have a mixture of brush, grasses and forbs. They also occur across desert with sparse grasses and barren plateaus. In most areas, big sagebrush is the dominant plant species and can be an important part of their diet. Chukars are usually found close to a water source, especially during the short, hot summers. Birds move continuously and range widely, especially during winter when they move in groups. In tough winters, when snow covers their rural habitat, Chukars may venture into agricultural fields or towns. Beginning in the late 19th century, Chukars were introduced across North America as a game bird. Since then, their populations have been stable and are slightly increasing. They are one of the most heavily hunted upland game birds and a favorite species among Western hunters. Chukars thrive in areas altered by overgrazing and fire. Population levels can vary dramatically from year to year, depending on environmental conditions; fires and cold winters can kill adults and chicks. Their ability to move long distances has enabled these birds to establish wild populations in 10 Western states — California, Nevada, Washington, Idaho, Arizona, Colorado, Montana, Oregon, Utah, Wyoming — and the Canadian province of British Columbia. They have also successfully colonized the six main islands of Hawaii after being introduced there in the 20th century. 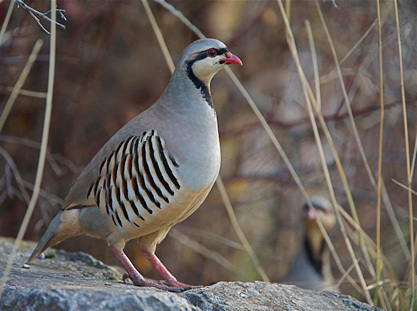 Chukars continue to be introduced in some areas and are managed as an upland game species. If you have the opportunity to participate or attend the National Amateur Chukar or National Amateur Chukar Shooting Dog Championship, you are in for a treat. Contact your regional officer, club or the AFTCA for dates and locations. See you there! The inaugural National Amateur Chukar Championship was run on the Red Rock grounds near Reno, Nevada beginning May 2, 1986. A total of 32 dogs were run before the stake was concluded at noon on May 4. According to the report by Dr. C. A. Hjerpe, “the event was acclaimed a rousing success by all who were fortunate enough to be in attendance”. The winner was The Kodiak, pointer male (The Texas Squire x The Master’s Mistress) handled by owner S. C. Walker. The Runner-Up was Santee Slam, pointer male (All Knight Sam x Dustie’s White Jude) handled by owner J. A. Purcell, Jr. The judges were Gary Parker and Collier Smith. 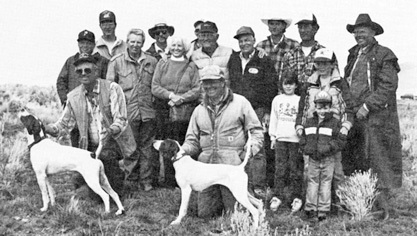 Three years later saw the inaugural National Amateur Chukar Shooting Dog Championship conducted on the challenging grounds of the Mile Post 7 area, 22 miles southeast of Marsing, Idaho beginning April 15. 15 pointers and 5 setters competed for the title that was won by pointer male Quillen’s Ramona Rex (Ramona’s Redsmoke Rex x Ramona Doll). Runner-Up was pointer female and daughter of the winner, Quillen’s Western Star (Quillen’s Ramona Rex x Quillen’s Ocean Breeze). Both Winner and Runner-Up were owned and handled by Chuck Quillen. The judges were Leroy Drussel and Neal McLean. By all account of Region 9 reporter, Glen Wiese, the stake was also a grand success.